Since taking office in November, the Law and Justice party has abandoned the institutions of liberal democracy in the raw pursuit of power. Warsaw—It is natural for parliaments to pass new legislation when new governments take power. But when a new government first eviscerates the Constitutional Court, and then passes a flurry of system-transforming legislation at breakneck speed—and during the holidays, when public attention is elsewhere—then it’s fair to talk about regime change and not a normal transfer of power. Since taking office in Poland in mid-November, the Law and Justice party (PiS, to use its Polish acronym), led by Jarosław Kaczyński, has pursued an uncompromising revolution from above that abandons the institutions of liberal democracy and any ethos of compromise in favor of an unchallenged monopoly of power. The new authorities call for a “strong” state instead of a “lawful” state, to be guided by “Polish values” and “Christian traditions,” deeply hostile to any political opposition, and imagining itself in a historic battle with a Europe committed to “totalitarian” ideas like gender equality and resettling refugees. The pace of legislation has been dizzying to the extreme. On December 29-30 alone, parliament passed two major system-transforming laws—repoliticizing the civil service and establishing party control of public media—while simultaneously passing two other laws of national significance (turning back the starting school age from 6 to 7, and levying a bank tax), and introducing a new intelligence bill expanding Internet surveillance powers. “We’re not even able to read the bills we have to vote on,” an opposition deputy complained. 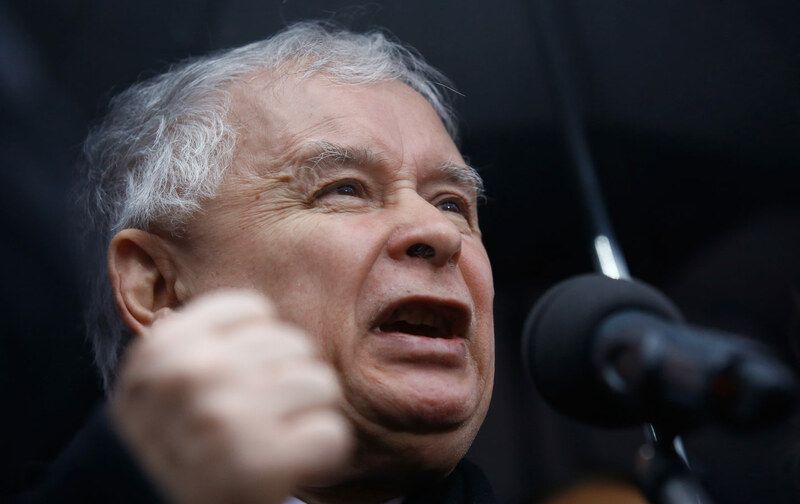 Kaczynski’s lethal combination of cynicism, hypocrisy, and determination was clear in the battle over the Constitutional Court. This burst of legislative shock-work came only a day after the president signed into law draconian restrictions on the Constitutional Court, stripping it of its ability (and obligation) to assess the constitutionality of this legislative agenda. PiS needs an eviscerated court because it lacks the votes to change the Constitution but pursues policies that violate it. Because the lethal combination of cynicism, hypocrisy, and determination long standard in Kaczyński’s arsenal reveals itself so fully in the battle over the Constitutional Court, a few details are in order. Soon before leaving office, the previous government appointed three justices to vacant positions on the Court, and then broke convention by nominating two more to positions set to expire later. PiS challenged this move to the Constitutional Court. But then it won the elections, and instead of just redressing the transgression by rescinding the two nominations, it annulled the selection of all five justices. When the Court then ruled as PiS had originally hoped (the president was required to swear in only the three justices, and the new parliament could elect two new ones), PiS balked. It didn’t care what the Court had ruled. It insisted that its own ruling was the constitutional one, and that all five justices were illegal. In a matter of hours it then chose, and had the president swear in, five new ones instead. Article 190 of the Polish Constitution reads: “Judgments of the Constitutional Court shall be of universally binding application and shall be final.” On what grounds, then, could the president, prime minister, and parliament so openly violate the Constitution? They offered only an authoritarian legal defense: they could do so because they had just won national elections, and so their views were more in line with “the nation” than a court made up of justices appointed in the past. On December 28 the president signed a new law that finally dispenses with the charade and renders the Court toothless. PiS presents every policy it proposes as the “will of the nation”—potentially making any critic a de facto traitor. Kaczyński has in fact been consistent throughout his career that any government he runs is in the interests of “the nation” and must not be subject to any institutional control, while governments run by other parties are contrary to the nation’s interests and not to be tolerated. When the opposition Civic Platform last won elections, Kaczyński claimed the voting was falsified, rejected the legitimacy of the president and prime minister, and portrayed virtually every policy of that government as a betrayal of the nation. Now, having won elections (with 37.5 percent of the vote), PiS presents every policy it proposes as the “will of the nation”—potentially making any critic a de facto traitor, a Manichean discourse that PiS supporters deploy regularly. The nation? In the United States, we use that term to refer to all the country’s citizens. In Poland, as in much of Europe, “nation” does not refer to real people but to some intangible “essence,” some mystical idea said to be unique to the dominant group of each country. Its nebulous, ill-defined nature is what makes it well suited to demagogues. So when one parliamentarian proclaimed during the fight against the Constitutional Court that “law is not sacred,” that “above the law stands the good of the nation,” and that “any law which does not serve the nation is only lawlessness,” it was natural that PiS gave this a standing ovation. In the PiS worldview there are no opponents, only traitors. And the ratcheting up of the vilification just when PiS policies encounter some resistance, the explicit prediction that resistance will arise because the “beneficiaries” of the old regime are losing, are nothing other than the modern equivalent of the Stalinist maxim about the class struggle getting more intense as socialism gets nearer. Constant reiteration of such vituperation encourages the fascistic Internet trollers who now heap death threats with impunity on liberal columnists. The aim seems to be to drive up the cost of dissent so that moderates accept the new authorities and critics get branded as enemies of the nation, to be disciplined or ignored as the authorities see fit. Can PiS succeed? Can it consolidate a semi-authoritarian state that rewrites laws without societal input and cuts avenues of participation for critics, making it difficult for any opposition to shape public debate, not to mention win elections? It is too early to tell. Right now Poland is essentially being governed as under a state of emergency: decree after decree, finalized by Jarosław Kaczyński, gets approved as law under the fig leaf of parliament. But is this too much for its own good? Passing laws that parliamentarians don’t have time to read creates laws that don’t make sense, leaving political appointees to improvise, and overreach, on the job. Purging bureaucracies of professional staff means new personnel uncertain how to get the job done, leaving constituents irate. Internationally the risks are high, too: in 2010, Hungary launched its own anti-democratic regime change, which caused an uproar in the European Union because it violated basic democratic ground rules among member nations. But Poland has nearly four times the population of Hungary and is more vital to the Union, so the PiS changes are likely to elicit even more criticism. Clearly, this kind of regime elicits strong internal opposition too, evident already in a series of mass protests. It’s unclear, however, whether such opposition will weaken or strengthen the regime’s authoritarian tendencies. A state that feeds on fears might well take the growing opposition as an opportunity to “discover” malfeasance on the part of that opposition. Indeed, many in the independent media expect such “scandals” to soon descend upon them. In the end, what will happen depends on whether PiS can keep its base, constituting at the time of its victory about a third of the electorate. This base consists of three groups, one guided by economics—those who feel insecure and excluded by postcommunist neoliberal capitalism, and two guided by ideology—fundamentalist Catholics, and secular intellectuals committed to “Polishness” and an enhanced place for Poland in the world. The last two groups are PiS’s unwavering supporters, who today defend the aggressive takeover of institutions as decisiveness on behalf of a noble cause. The first group, however, which supports PiS for its economic promises to combat the insecurity and inequality of Poland’s peripheral capitalism, is the largest and most important, because this is the group that is up for grabs. Here we get to the problems, and opportunities, for Poland’s left. Twice before PiS first came to power, parties aligned with the liberal left secured strong labor support. But by insisting on marketization, privatization, and participation (as a peripheral player) in the global capitalist economy, and disparaging demands for more security, they soon squandered that support, and ended up driving regular workers into the arms of PiS. Kaczyński first won significant labor support in 2005, largely by offering anti-elite cultural resentments and nationalist identity politics as cover for the lack of any economic program that could help regular employees, much as the US Republican Party has so often done. This was not enough, however. In 2007 PiS lost to the more outright market liberals of Civic Platform, who pursued a pragmatic politics of adapting to the European Union and not alienating the Church, while suicidally pursuing a hard agenda against workers. Under its tenure, Poland became Europe’s leader in having part-time, so-called “junk” contracts for workers, while the government was so wary of trade unions (even though density has fallen to a record low of 12 percent of the work force) that the Tripartite Commission—bringing together representatives of business, labor, and the state—ground to a complete halt. Kaczyński won in 2015 by focusing on economic issues. Insecurity and anxiety may not be so visible in Poland’s thriving big cities, but they are rampant in the still-deprived countryside and small cities, some now stripped of working-age adults who have left en masse looking for opportunity in Great Britain and elsewhere in the EU. These were the issues PiS spoke about during the election campaign, not the Constitutional Court or taking over the civil service and media. Its campaign slogan, “Good Change,” focused on making life and work more secure, on supporting workers and unions. Its two main specific proposals called for monthly payments to parents of children under 18, and rolling back the retirement age from 67 to 60 (Civic Platform had raised it only in 2012). PiS won because of its promise of economic security—just what the right speaks of elsewhere in Europe. Terrorism and immigration are in fact only the latest issues around which the right is mobilizing. For most of this new century, economic insecurity has fueled the rise of this right. Unsurprisingly, this has also been the time when Europe’s social agenda declined and the European Union has become mainly a common market for the free movement of capital and labor. Here we see the unfolding of a maxim of contemporary politics: too much economic liberalism threatens political liberalism. The problem, then, is not that people are not committed to democracy. Yes, plenty of people today aren’t committed to democracy, but they’re not committed to it because they feel that democracy, packed in neoliberal wrapping, is not committed to them. New-right narratives seep easily into such turf. PiS, like the far-right Fidesz in Hungary, cannot fix the problems of the market, and is not anti-capitalist. But a key part of the party’s appeal, and success, is that it does implement some specific policies—such as the new tax on large banks and insurance companies—that, were they to be introduced by a left-wing party, would be widely embraced by progressives as solid steps in the right direction. PiS may well fail. Its support for domestically owned businesses will clash with the interests of labor, and Kaczyński’s uncontrollable nastiness and political overreach may revive strong support for basic liberal decency. But because it has a considerable base of support, and offers not just ideology but concrete ameliorating measures, it will be defeated not by moral condemnation and appeals to democracy, but by a program and narrative equally sensitive to the dangers of the market, the need for social protection, and the desire for belonging to some overarching community. A small but growing new left in Poland argues just this. Founded less than a year ago, the party Razem (Together), which seeks democratic and participatory solutions to economic inequality, took 3.6 percent in the recent elections. Along with the more established left, now a motley association of old-style bureaucrats, union activists, feminists, and greens, it may well present a challenge in the future, particularly if it is able to combine social concerns with national traditions. For now, however, illiberal authoritarianism is on a roll. PiS deserves the strongest international condemnation for its campaign against democracy, its disregard for the rule of law, its dangerous vilification of critics. Yet any rejection of PiS that continues to ignore the social base of the discontent that brought it about will only produce a stronger and more ruthless right-wing backlash in the future.